Go to the Administration section of your site and open the Currency Switcher Options page. Switch to Open Exchange Rates as the exchange rates provider. It requires an API key, which can be obtained free of charge using their Free Forever plan. Click on Save and update exchange rates. This will fetch the exchange rates from the provider and update them automatically. Update the Currency Switcher plugin to version 1.9.22.130827 or later, which improves the handling of abnormal conditions that may occur while retrieving the exchange rates. All done! Your site will be now operational again, and you won’t have to worry about downtime of exchange rates provider. Improved handling of unexpected conditions when exchange rates cannot be retrieved from a provider. When a provider becomes unavailable (as in the case of WebServiceX outage occurred on 27/08/2013) the existing exchange rates are not affected, rather than being incorrectly overwritten with zero. Fixed minor bug that caused the PayPal Pro payment gateway not to be displayed when the Admin area was accessed without using HTTPS protocol. Fixed issue with formatting of shipping and tax totals when displaying past orders. In some configurations, it could happen that the numeric code of a currency symbol was interpreted as the shipping amount, thus always displaying “36” for US Dollars, no matter what the real amount was. Note: the issue was purely cosmetic, and it just affected the rendering of order pages and order confirmation emails. Despite that, orders were processed normally and the correct amount was charged for shipping and taxes. As announced earlier, the Beta version of Currency Switcher 2.0, with support for multiple currency pricing of each product, is now available. As per original schedule, this version has been tested on WooCommerce 2.0.x, thus, while it may be also working on WooCommerce 1.6.x, compatibility is not guaranteed. Link to version 1.x, currently stable and supported. Link to version 2.x, currently in Beta and not covered by support. Please contact Support, quoting your order number and the email address you used to place it. You will be re-sent an order confirmation, which will contain a download link for version 2.0. Please note that, Beta version is being provided as a preview, for evaluation purposes only, due to the high interest expressed by many visitors. As per Terms and Conditions of sale, Beta versions are not covered by free support. It’s therefore recommended not to use Beta versions in production. 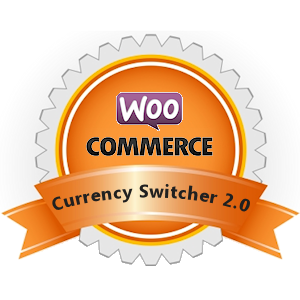 I would like to thank all the customers and readers who contributed their ideas towards the improvement of the Currency Switcher for WooCommerce, your feedback is greatly appreciated. I will endeavour to continue providing the best possible service, and expand the product selection in the near future. Thank you all for your support. Plugin now allows to indicate how many decimals should be used when each currency is selected. Such information is then used to display and round prices during conversion, making it easier to accept currencies that don’t use decimals, such as Japanese yen (JPY) and South Korean won (KRW).